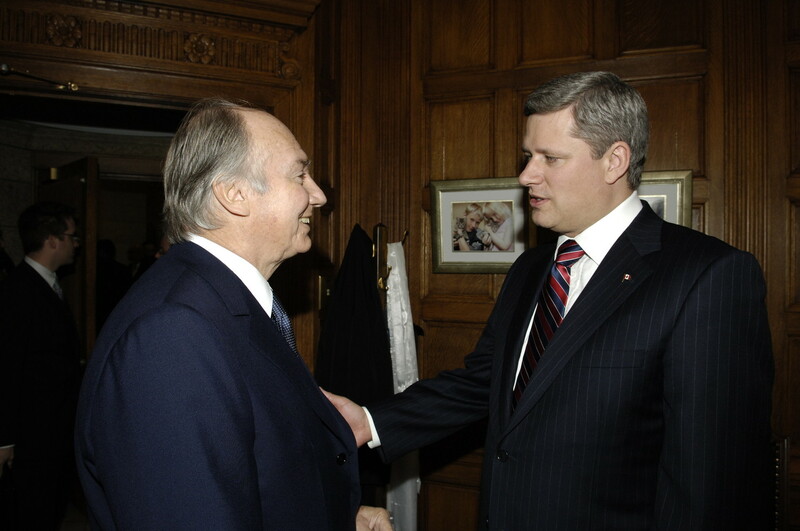 His Highness the Aga Khan is greeted on Parliament Hill by The Right Honourable Stephen Harper, Prime Minister of Canada. Ottawa, Canada, 25 October 2006 - His Highness the Aga Khan will meet today on Parliament Hill with The Right Honourable Stephen Harper, Prime Minister of Canada, and The Honourable Beverley J. Oda, Minister of Canadian Heritage, to sign a funding agreement for the Global Centre for Pluralism, to be located in Ottawa, Canada. The Global Centre for Pluralism is a major new international centre for research, education and exchange about the values, practices and policies that underpin pluralist societies. Drawing inspiration from the Canadian experience, the centre will function as a global repository and source for knowledge about fostering pluralistic values, policies, and practices. It will work with countries to nurture successful civil societies in which every citizen, irrespective of cultural, religious or ethnic differences, is able to realize his or her full potential. “The rejection of pluralism is pervasive across the globe and plays a significant role in breeding destructive conflicts,” says the Aga Khan. The Centre will therefore undertake research, deliver programs, facilitate dialogue, develop pedagogical materials and work with civil society partners worldwide to build the capacities of individuals, groups, educational institutions and governments to promote indigenous approaches to pluralism in their own countries and communities. The Aga Khan has described the Canadian practice of seeking unity in diversity as “Canada’s gift to the world.” The decision to locate this major new institution in Canada’s capital city was therefore a natural one. The mission of the Centre supports several key Canadian international policy objectives, among them the promotion of democracy and good governance, a more equitable sharing of the world’s resources between developed and developing countries, and the projection of Canadian values, such as the rule of law, human rights and respect for diversity. Under the terms of the agreement, the Government of Canada will contribute C$30 million towards the establishment of the Centre’s endowment fund. The Aga Khan will contribute a minimum of C$30 million toward the endowment and the refurbishing of the former Canadian War Museum, which the Government is making available on a long-term lease to serve as the Centre’s global headquarters. Registered under Canadian law as a non-denominational, bilingual, non-profit organization, the Centre will be guided by an independent Board of Directors made up of leading Canadians and high-profile individuals from around the world. The Board will be jointly constituted by the Aga Khan Development Network and the Government of Canada. His Highness the Aga Khan will lead the Board as Chairman. Drawing on the pluralistic model of Canada and the diversity of the Ismaili community worldwide, today’s announcement marks the culmination of a long-standing dialogue initiated in 2002. Since that time, both the Government and the Centre have consulted with a number of leading Canadians and civil society institutions to validate the mandate and proposed activities of the Centre. The Global Centre for Pluralism will engage with a wide range of partners, among them civil society organizations, research institutes, and academic institutions. The programmatic activities of the Centre will begin in 2007. His Highness the Aga Khan is the 49th hereditary Imam (spiritual leader) of the Ismaili Muslims, comprised of ethnically and culturally diverse peoples living in over 25 countries around the world. A Harvard graduate in Islamic history, the Aga Khan succeeded his grandfather as Imam of the Ismailis in 1957. He is the founder and Chairman of the Aga Khan Development Network. The Aga Khan Development Network (AKDN) is a group of private, non-denominational development agencies working to empower communities and individuals to improve living conditions and opportunities, especially in sub-Saharan Africa, Central and South Asia, and the Middle East. The Network’s nine development agencies focus on social, cultural and economic development for all citizens, regardless of gender, origin or religion. The AKDN’s underlying ethic is compassion for the vulnerable in society. Its annual budget for philanthropic activity is in excess of US$ 300 million. The Government of Canada and the AKDN have a longstanding and successful partnership that extends across many fields and several countries. For example, Aga Khan Foundation Canada has, for over twenty years been an important partner of the Canadian International Development Agency in a series of development programs ranging from rural development in Bangladesh, India, Pakistan and Tajikistan to early childhood education in eastern Africa.